Metallogenic model of the deposit of the deep deep prospecting significance LANG Peng-lin;SONG Jun-qiu;Inner Mongolia mountain gold geology and mineral exploration Co. Cleaning of Scar in Pipeline and Pressure Vessel in Aluminum Production Liu Zhilong;liuxin;Shandong Nanshan Donghai Alumina Co. 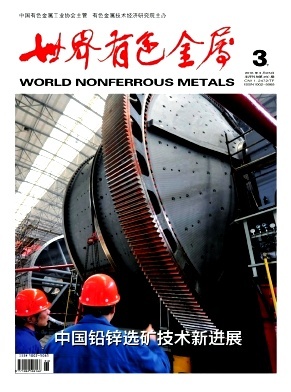 Some problems existing in the filling mining technology in gold mines YIN Xiao-can;YANG gang;Liaoning Paishanlou Gold Mining Co.
Big well mineral separation of copper and zinc in Inner Mongolia research practice WANG Zhi-yuan;Chifeng Dajingzi Tin Industry Co. Hot rolling process quality control and standardization management scheme and its application HU De-hong;MA Chun-hong;Hebei iron and steel co.LTD. Study On Improvement Of Silico-Calcium Smelting Front Of Furnace Equipment Ma Yongning;Xue Kai;Li Xingbo;Shan Xi Shenghua Metallurgical Chemistry Co.
Study on Recovery of Molten Salt Waste in Rare Earth Electrolysis XIAO Yong;CHEN Yue-hua;CUI-Xiao-zhen;Yiyang Hongyuan Rare Earth co. Metallurgical production fan system fault diagnosis and computer simulation experiment LI Xiao;Tangshan Iron and Steel Co. Stability of the converter Furnace research and application of micro-differential pressure LIU Bin;YANG Hai-jun;LI Zheng;Tangshan Iron and Steel Co. The study on the adsorption of phosphate-containing wastewater by chitosan modified bentonite Hu fengjie;Zhao taotao;Zhang yong;Henan Yuguang Gold&Lead Co.
Functional optimization of acid regeneration control system PEI Zheng;Tangshan Iron and Steel Co.